Wolf Lake has become one of the premier lakes for windsurfing. Any given day of the week you can find windsurfers enjoying the brisk and plentiful winds coming off of Lake Michigan and skimming across the surface of Wolf Lake. It is not exactly Maui or Baja California or the Columbia River Gorge, all of which lure the bronzed faithful looking for the big ride. But here in the heart of the industrial Midwest, far from the big surf and cobalt-blue horizons of the coast, this is as close as it comes to the endless summer: 400 acres of shallow inland water sandwiched between the steel mills of south Chicago and the steel mills of East Chicago. Wolf Lake’s surface covers more than 804 acres. Bisected by the Illinois-Indiana state line, Wolf Lake is convenient for all those local looking for a place to relax, recreate and ride the wind! 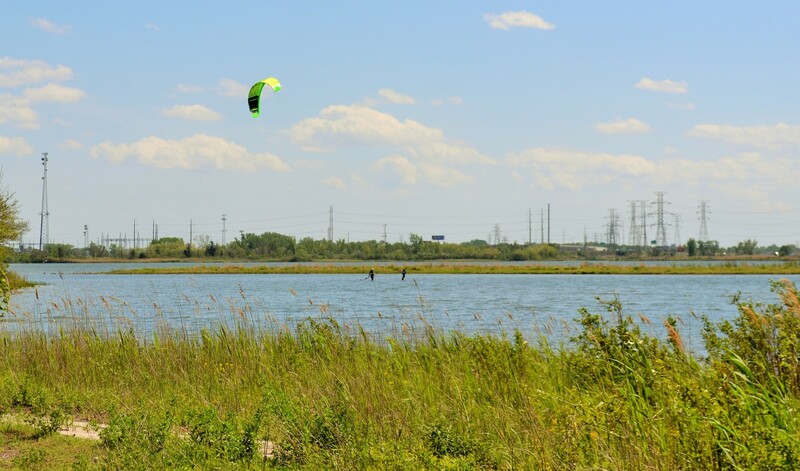 Windsurfers regularly launch onto Wolf Lake near the splash pad of the Wolf Lake Aquatic Play Center. Ample free parking is just steps from the shore for no-hassle access.